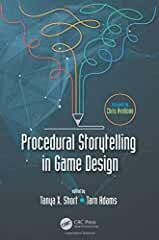 CRC Press has published Procedural Storytelling in Game Design, 1st Edition. This edited collection of chapters concerns the evolving discipline of procedural storytelling in video games. Games are an interactive medium, and this interplay between author, player and machine provides new and exciting ways to create and tell stories. In each essay, practitioners of this artform demonstrate how traditional storytelling tools such as characterization, world-building, theme, momentum and atmosphere can be adapted to full effect, using specific examples from their games. The reader will learn to construct narrative systems, write procedural dialog, and generate compelling characters with unique personalities and backstories.